Password JDM Zoomer/Ruckus Anti-Flex Frame Sliders HONDA - Dezod Motorsports Inc - Home of the automotive performance enthusiast since 2002. 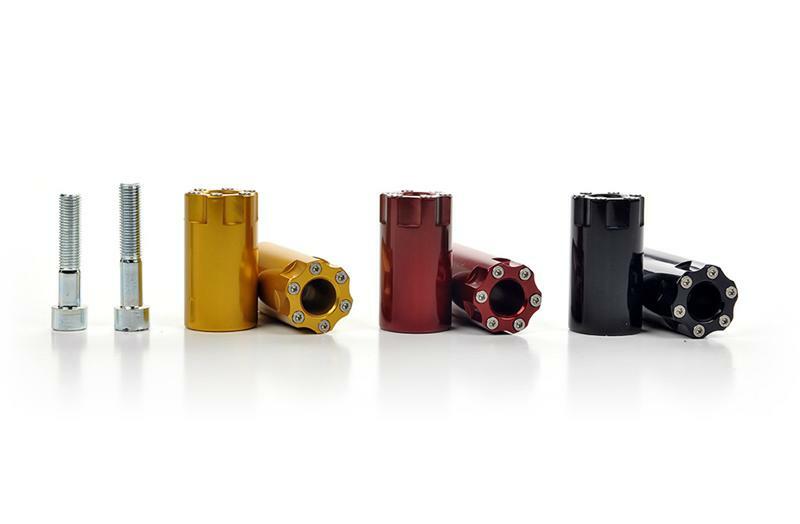 The Password:JDM Ruckus Anti-Flex Bushing with integrated frame sliders is the answer to all the guys (this pretty much means all the guys who rides a ruckus) who are tired of that 5-o’clock lean that you often see with the Ruckus. This “lean” or “slant,” whichever you may prefer to call it, is a problem created when your Ruckus has a load or the ride height has been adjusted. By design, the engine/rear axle is mounted with 3 points, and since these 3 mounting points are unevenly distributed, the lean or slant gets worse with weight or ride height being adjusted. You can correct this problem by adding another rear shock to the right side of the frame and making it 4 point mounted or you can just get The PWJDM Ruckus Anti-Flex Bushing. Getting the PWJDM Ruckus Anti-Flex Bushing is a very cost effective solution. It works by eliminating the deflection from the motor mount bushings and loading more it onto the frame. This stiffens and reinforces the forward mounting points on the engine and corrects the geometry for a smoother straighter ride. Will you feel a difference? Absolutely… and you will definitely wished you got this earlier… well, it’s only been available as of recently… so you better get it now. And always remember that PWJDM designs and builds these in house. You can expect other great and innovative products to drop real soon from PWJDM… please stay tuned! •100% made in the USA.